Enchanted Excurse: Spread The Love! 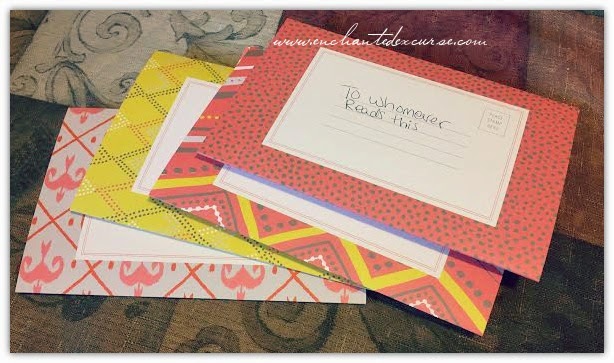 Disclosure: I received The World Needs More Love Letters All-In-One Stationary and Envelopes by Hannah Brencher complimentary from Blogging For Books. Provided I give an honest review. Hello Loverlies! 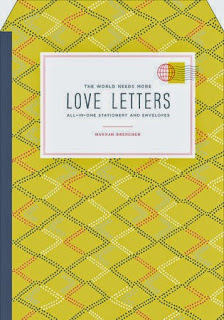 There is this book called The World Needs More Love Letters All-In-One Stationary and Envelopes by Hannah Brencher. This isn't exactly a book, as you can tell by the title. I think it is very awesome though! She made it to help inspire people to write letters of love and encouragement. Whatever you can think of to write to someone, as long as it is positive, you can do it. It is stationary that havs different prints on it, in which you can fold it and add a stamp if you want to mail it. What I did was write words of encouragement and a scripture. Then I took the letters and stuck them in books at Hastings for whoever finds them to read and take. I am hoping that some folks have found them already. It makes me excited knowing just sending out some positive words can just lift someones spirits. I believe after I use up all this stationary, I am going to make my own or purchase some more stationary. I am going to make sure I keep doing it. Maybe if we all chip in and spread random words of love and positivity, we can help make the world more pleasant. There is one other thing I would like to share with y'all. Brencher also started the More Love Letters website. This website you can nominate someone who is in need of receiving some positive words. Which is awesome! They will send them a love letter bundle to cheer them up. These love letter bundles are from people who volunteered to send them. There is an area on the site called love letter requests where it shows the persons name, what they are struggling with, and what their address is. That way anyone can send them a letter. They also set up a date when the letter is due so you know when to get your letter mailed out. This stationary book is the perfect book to purchase for you to get started on your own love letters. I also love the fact when you first open it, on the left side shows some ideas of what you can write. HERE is the link where you can purchase it. It is not a waste of money at all! Have a Blessed Day! About The Author: Hannah Brencher is the creator of The World Needs More Love Letters (moreloveletters.com), which has been responsible for over 20,000 letters written by volunteers. Hannah has given a popular TED talk and has been featured in the Wall Street Journal, Glamour, TODAY.com, Oprah.com, HelloGiggles.com, the White House’s “Women Working to Do Good,” and onCNN World News. She has worked with the U.S. Postal Service and was honored by the Random Acts of Kindness Foundation.